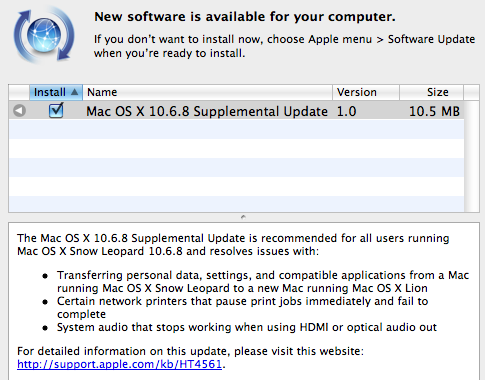 Apple has released a supplemental update for Macs running Snow Leopard 10.6.8 released last month. Mac OS X 10.6.8 Server Supplemental Update is recommended for all servers currently running Snow Leopard Server. This update includes specific fixes for server-side performance issues when using Server Monitor. Download links: Mac OS X 10.6.8 Supplemental Update and Mac OS X 10.6.8 Server Supplemental Update. â€¢ Mac OS X 10.6.8 Update v.1.1. â€¢ Mac OS X 10.6.8 Update Combo v1.1. â€¢ Mac OS X Server v10.6.8 Update v1.1. â€¢ Mac OS X Server v10.6.8 Update Combo v1.1.